Shabbat shalom and happy Sukkot everyone. Welcome and thank you for being here with me for this special celebration of my bar mitzvah. My name is Natan Weisblum. I am the youngest in my family. Many of you know me since I was 3 years old. Many of you attended my upshernim- the traditional hair cutting ceremony. I’ve grown some since then, right?? I study a lot, and I also like to do many interesting things. My hobbies aside from learning include playing chess, riding a bike, and playing basketball. This past year, I was accepted to a special school in Israel where my parents wanted me to get a top education. There are 21 really nice, smart boys in my class. When I grow up, I hope to follow in my father’s footsteps and become a Rabbi, but, I also have a dream to have a part time job, and be a scientist. I am blessed with a loving family and I have an understanding of cultural life in America and Israel, my two special homes, and thanks to that I can speak both Hebrew and English. The meaning of my name: Natan is "to give". I’m named after Rabbi Elimelech of Lizensks brother, whose name was Rabbi Natan. He lived in the 1800’s. I am the 10th generation from him. I try to be a nice Jewish boy, a mentch. I call and visit my maternal grandmother and my paternal grandparents on a regular basis. I am also blessed to have a great grandmother in Jerusalem that sadly is in a wheelchair. I visit her and try to make her smile. 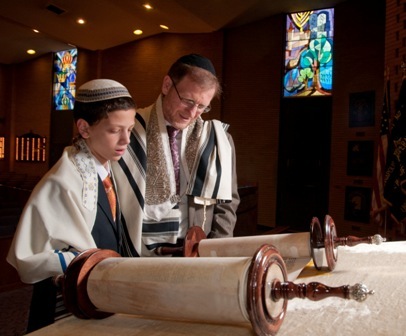 As a 13 year old man, I do not know what life will bring, but I live life according to Torah and try to do as many mitzvot as I can. I hope as you are sharing in my simcha, I will be sharing in your simchas! You guys are my extended American family. On Sukkot, it says in the Torah "v’smachta bechagecha", which means be happy on your holiday. The sages discuss when should this mitzvah be done. So the conclusion was that there is a mitzvah in the torah to be happy on Sukkot, which means in every holiday there is something unique. For example: Pesach is the time for freedom. Shavuot is the time, for receiving the Torah. On Sukkot it is the time just to be happy. So I hope celebrating my simcha will help you to do the mitzvah in a natural way. Abba, father, I’m so proud that you are the spiritual leader of this wonderful Annapolis community. Thank you also for being my best teacher and role model. Emma, you are a wonderful mother. You tell me great and meaningful stories. I remember the days when you used to play on the accordion until I fell asleep. You are also a terrific cook. You make the greatest chicken soup and fish, but my favorite, is your delicious hot dogs with eggs. Speaking of hot dogs, when I came to America, I was so happy when I discovered that there was a famous hot dog named after me…Nathans hotdogs. But then, I was so disappointed when I found out that they were not kosher. So now I pray for Mashiach every day, and in that prayer I add, that when he comes, Mashiach, Nathans hot dogs will be Kosher! Now back to the thank yous. Thank you to my siblings- Elimelech, and his wife Ayala, Bracha her husband Reuven, sister Ayala, and brother Meir. Thank you, Congregation Kneseth Israel for giving me the wonderful childhood memories. Folks, I could talk for hours, but now I’m giving you one of the greatest gifts, a bar mitzvah boy can give to the congregation. I am going to Stop talking so we can finish shul services, sooner than later, and we can all go to Kiddush and EAT! Thank you and have an amazing Shabbat and Sukkot holiday.